My thoughts, opinions, and whatnots. I was watching E!’s show 10 Vampires We Love shortly after I came home from watching New Moon. The show was a countdown of the vampires that the people of E! like. I’ll include the list at the end of this post. Anyway, I have a bone to pick with who they chose to be on the list. I noticed that the list didn’t include, in my opinion, a variety of vampires, and the fact that all, except one, of the vampires are from movies or tv shows that came out within the last ten years. Anyway, what I mean by the lack of variety is that four of the vampires came from two different sources. I find it biased like how this post is. 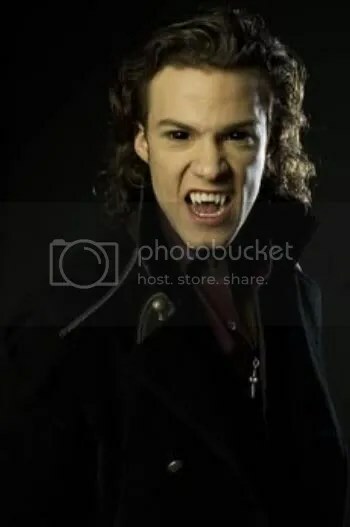 The reason that I have a problem is that they didn’t include other vampires like Henry Fitzpatrick from Blood Ties, Mick St. John from Moonlight or any of the vampires from the Vampire Chronicles or The Lost Boys. I don’t think it’s right to put a relatively unknown vampire like Santinico Pandemonium or Dracula from Dracula 2000 on a list like 10 Vampires We Love when there are better qualified vampires out there.